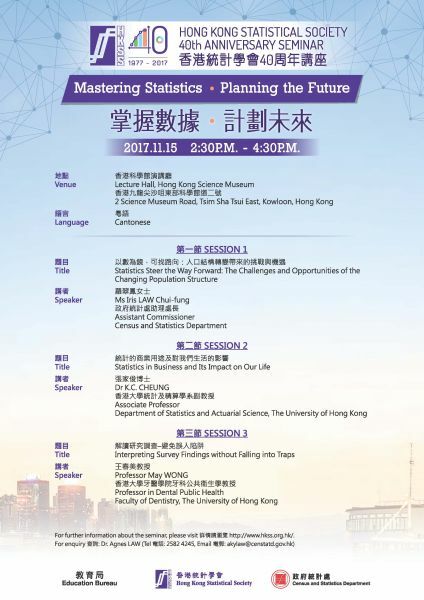 The Hong Kong Statistical Society (HKSS) held a public seminar "Mastering Statistics, Planning the Future”, along with the Census and Statistics Department (C&SD) and the Education Bureau, on 15 November 2017 at the Hong Kong Science Museum in order to celebrate the 40th Anniversary of the Society. The seminar aimed at analysing the challenges faced by our society in the future under the trends of population ageing and decline in labour force, and exploring the potential sources to replenish our labour force, as well as introducing how statistics is used in business decision-making and how this in turn affects our daily lives. The audience could also learn about common errors found in media reports of survey findings and how to avoid misinterpretation of the reported figures.